A very gritty crime drama that is sure to entertain. Made for there is enough balance in this film that it is sure to please nearly everyone. I am sure everyone is going to be talking about this but seriously, Ben Affleck is here to stay. Following his impressive debut with “Gone Baby Gone“, Ben Affleck proves with The Town that he has a lot of talent as a director (at least when it comes to crime dramas). The film is an adaptation from the novel “Prince of Thieves” by Chuck Hogan — winner of the 2005 Hammett Prize for excellence in crime writing — and is set in Boston, more specifically in the burg of Charlestown. 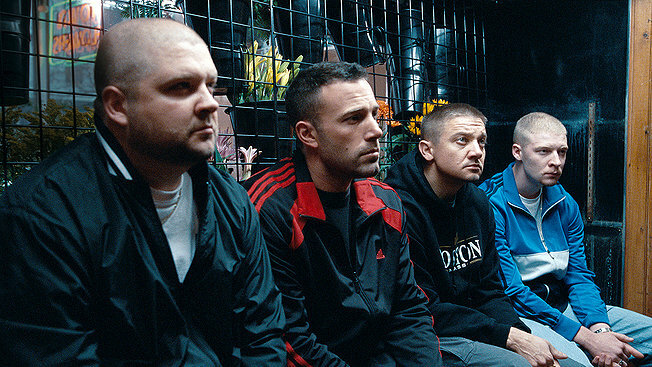 The Town follows a crew of close friends led by Doug MacRay (Ben Affleck, Good Will Hunting). From the very opener they make it very clear to us that Charlestown has produced more bank robbers than any other location in the nation. In Charlestown robbing banks is a family business, passed down from generation to generation and nobody is currently better at it than Doug’s crew. Big props go out to the whole cast for doing an amazing job of capturing the grittiness of this story. Acting wise, Jeremy Renner (The Hurt Locker) is so magnetic as he plays the role of “the unpredictable wild card” that you can’t help but cringe whenever he is on screen. Another performance I really enjoyed was that of Doug’s father played by Chris Cooper (American Beauty). In this scene Doug visits his father, a career criminal doing several life terms in prison. Cooper’s performance is haunting as we get a taste of what kind of environment Doug had to grow up in. While Cooper is only in this one scene it is very memorable and really carries us through the film as the rest of the story unfolds. Another thing that impressed me about The Town was the incredible balance between tense action scenes and romance. While The Town is packed with violence it also contains a very surprising depth when it comes to the relationships within it, especially the love story between Doug and Claire (Rebecca Hall, Vicky Cristina Barcelona). Overall, I believe that fans of the crime drama genre will be very pleased with The Town. The good mixture of car crashes, gun fights and love should keep most people entertained. My suggestion would be to check it out, it is worth it.